Participants will join together each Saturday morning during the season of Lent (March 9 through April 20) from 10:00 am until 11:30 am for a time of fellowship, study, and conversation focusing upon the book Breaking the Color Barrier. Finally, participants will be asked to join together in a total of six or eight supper club gatherings (to be held over the course of the following 10 months) in one another’s homes for a guided time of study and further conversation on racial reconciliation through February of 2020. We hope this initiative will lead to a deeper partnership with Cascade to make a difference through outreach in our community. More details in the form of a brochure will be coming shortly, but I would be grateful if many of you would consider participating in this opportunity. Certainly, be in prayer that our Lord would use this initiative that we might further the work of God’s kingdom. Thank you for your consideration and your prayers. I hope you are planning to join us for worship this Sunday for one of my favorite services of the year – Baptism of the Lord Sunday. This is that day when we close the service by approaching the font, touching the water, and remembering our baptism. It is a great way to make a new start spiritually. The sermon will focus upon the second part of our “Fruitful Congregations” series: “Passionate Worship.” I still can hear the words of my professor Leonard Sweet echoing in my ears: “The unpardonable sin is to make the worship of Almighty God boring.” I am grateful that our worship at Peachtree Road is vital and inspiring, and I hope you will be present as we talk about how “passionate worship” nourishes our soul. At the close of this week’s services, after touching the water and remembering your baptism, you will have an opportunity to turn in your Every Member in Ministry commitment card (the online version is linked here). Can you imagine if we lived out that slogan – every member in ministry? If all of us selected at least one ministry area in which to participate, there is no end to what we could accomplish for the sake of Christ. 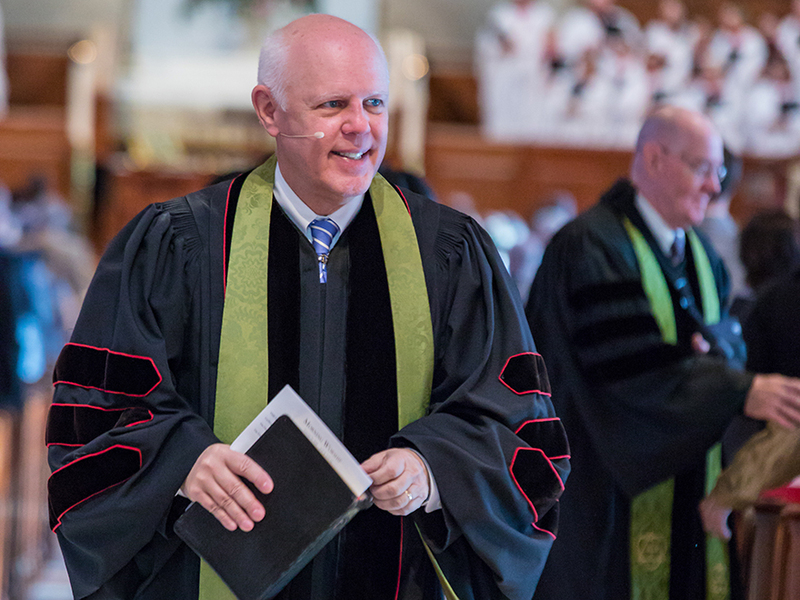 Thank you in advance for your support of Peachtree Road’s ministry in 2019. Finally, let me offer a word of appreciation for your generous support of our Water for Kenya offering to purchase water filters for those living in the Kabazi region of Kenya. We had set a goal of $240,000 for the offering, and once again you surpassed that goal. The final count is not in, but your giving already has exceeded $250,000! Well done! In just a few short weeks, the life-changing gift of clean water will be offered to the families living in that region, and their lives will be transformed. Thank you for your generosity! The work of Christmas begins: to find the lost, to heal the broken, to feed the hungry, to release the prisoner, to rebuild the nations, to bring peace among brothers, to make music in the heart. Together, let us be about the work of Christmas! See you Sunday.